This artist's impression shows a massive baby star surrounded by dusty disk of material with jets similar to those seen around the star IRAS 13481-6124, a star 20 times as massive as our own sun, but only 60,000 years old. Full Story. Astronomershave found a disk of dust around a huge, massive star in its early stages ofgrowth, indicating that stars big and small form by the same mechanism. The big staris only about 60,000 years old ? a cosmic baby when compared with our sun,which is 4.6 billion years old. But it has a mass about 20 times that of our sun and is surroundedby a disk of material similar to what is found around smaller, growingstars. "Ourobservations show that accretion disks around stars as massive as about 20solar masses can exist, suggesting that this is likely the dominant formationmode," said study leader Stefan Kraus of the University of Michigan. Kraus andhis colleagues used recent enhancements in infrared interferometry techniquesto scan the star at high resolution for signs of dust. They found the star tobe surrounded by a so-called circumstellar disk measuring some 130 astronomicalunits (12 billion miles) across. One astronomical unit is the distance betweenthe Earth and the sun, about 93 million miles (150 million km). The researchis detailed in the July 15 issue of the science journal Nature. For decades,astronomers have been confident that relatively low-mass stars such as our sunform by the gradual accretion, or buildup, of mass from a disk of gas and dust.They were less certain about stars with more than 10 times the sun's mass. Earlycalculations suggested the solar wind and pressure of radiation emanating fromsuch a large star might halt the infall of material from the disk, meaning the formationof massive stars would have to occur by some other mechanism, such as themerger of smaller stars. 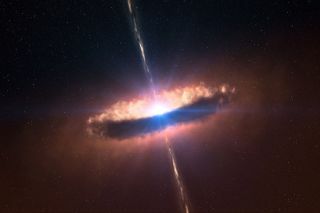 More-recentwork indicated massivestars could form by accretion after all, but researchers had not actuallyobserved it. ?This is the firsttime we could image the inner regions of the disc around a massiveyoung star," Kraus said in a statement. ?Our observationsshow that formation works the same for all stars, regardless of mass.? In the newstudy, researchers observed a temperature gradient in the star's circumstellardisk. Closer to the star, the disk was hotter. The group also identified adust-free region between it and the surrounding disk, indicating that thestar's energy had evaporated the dust molecules closest to it, as researchershave observed in smaller stars. Additionalmeasurements provided evidence of jets of gas shooting from both ends of thestar perpendicular to the disk and striking the gas cloud around the star.
? ?Such jets are commonly observed around young low-mass starsand generally indicate the presence of a disk,? Kraus said. The dataalso confirmed that the size of the circumstellar disk is related to the star'sbrightness in the same way as with smaller stars, implying that the samephysical processes are at work, he added. The finding"is a significant achievement, both technically and scientifically,"said astronomer Hans Zinnecker of the University of Stuttgart, who was notinvolved in the study. "Theonly remaining doubt," he said, "is whether massive stars of muchhigher mass, say 50 or 100 [solar masses], will form by the same accretionprocess."